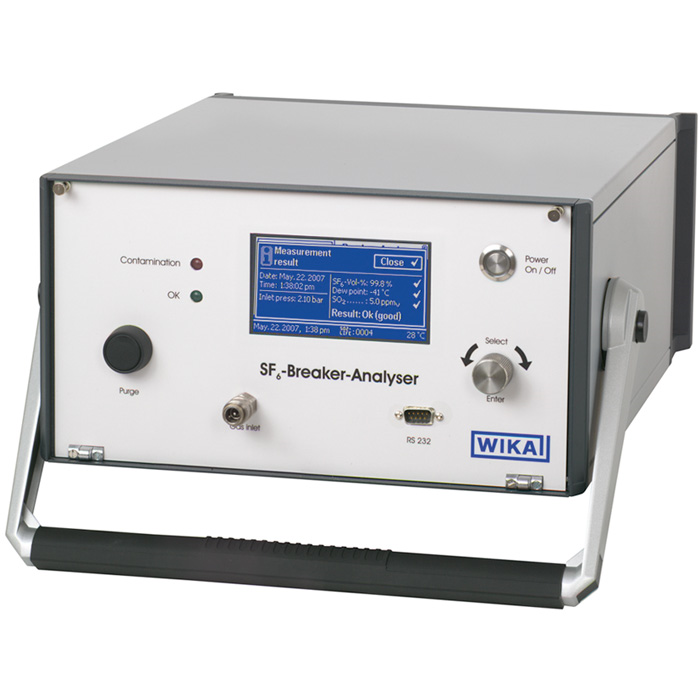 The model GA10 analysis instrument is an innovative and cost-effective solution for determining the quality of SF6 gas. The GA10 consists of a basic instrument with display and an integrated electronic data acquisition and processing. The completely modular concept enables the user to expand the basic instrument with sensor cartridges which can be sent to calibration individually. With the completely equipped instrument, it is possible to measure the purity of SF6 gas, the humidity and the SO2 or HF concentration, respectively. The GA10 determines the pressureised dew point of the SF6 gas by means of the pressure measurement of the test gas and the measured humidity. The combined measurement of all measurement parameters mentioned above minimises both the measuring time and the required quantity of test gas. The measuring instrument will be delivered with matching accessories and transport case. With the help of the rotary push-button and the clear menu navigation, the operation of the analysis instrument is easy and without difficulty. After the measurement has been started, the sensor values are automatically compared with the set limit values per CIGRE B3.01.01, IEC or customer-specific standards. Following the measurement, two status lamps (green, red) indicate whether the test gas composition is OK or whether it does not comply with the set limit values. At least 150 data records can be stored in the internal measured value storage. It is possible to export and archive the data on a PC using the included "SF6-Reviewer" software. A model GA45 gas recovery bag is to be connected at the outlet of the GA10 for collecting the measuring gas.